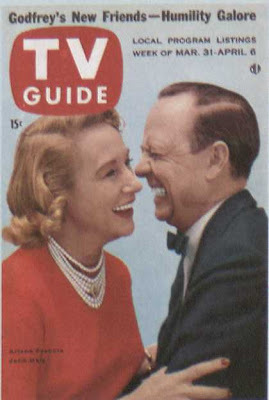 From coverbrowser.com..TV Guide cover for March 31-April 6, 1956 with Arlene Francis and John Daly..Daly was ABC News President for a time, but also hosted What's My Line? from 1950-67. Miss Francis was with What's My Line through it's syndicated years from 1968-75..A total of 25 years.. 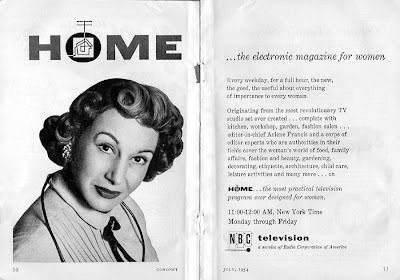 Here, from Monday March 25, 1957 is the first half hour of "Home", with Hostess Arlene Francis, courtesy Internet Archive..Miss Francis had a long and varied career as a Movie and TV Actress, Radio Hostess, and TV Panel celebrity..Here she hosts sort of a "Woman's Magazine" Created by Sylvester "Pat" Weaver, who also created Today and Tonight for NBC..This half hour features Coubtry music artist Ken Turner and Family, along with visiting by film with an Alabama family. 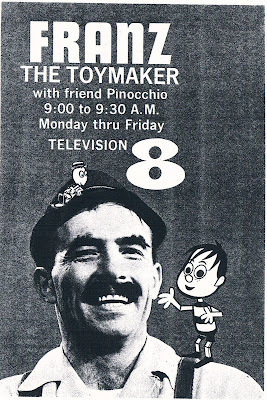 Near the end of the half hour, we are treated to a "golf fashion show" as we see Ladies golf clothing through the years..
February, 1964 ad for "Franz The Toymaker" (Ray Stawiarski) on WJW-8..Chuck Schodowski has some very entertaining stories of "Franz" while on The Ghoulardi/Hoolihan and Big Chuck All-Stars sports teams in his recently published book, "Big Chuck"
Early Test Pattern for WAKR-TV 49-I honestly forget where this is from..Whoever originally had this on their site, let me know so I can credit you properly..Thanks. 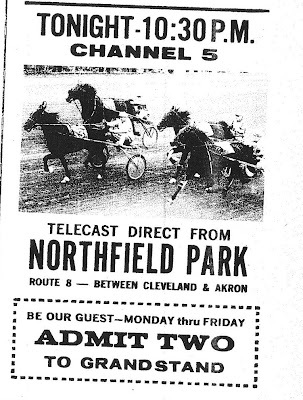 As most here know, I get much of my material for posting from various newspapers and TV Guides, making occasional trips (mostly by bus) to Akron and Cleveland to copy such material..I have just been made aware of a TV Magazine called TV Scope, which was locally produced in the Cleveland area and at least included Cleveland and Erie, Pa. listings..A new reader, who wishes to remain anonymous, acquired 9 "TV Scope" Magazines from the 1958-60 period a few years ago and has graciously offered them to me for use on the blog..I would like to thank this person publicly for their sharing and support.. Thought I'd put up a little panel show fun..Honestly just to get something up this week..Mike Stokey's Pantomime Quiz Time-This show ran locally in Los Angeles from 1947-June 1950...CBS picked it up for The Summer of '50 for the first of several short runs on all 4 TV networks at one time or another..All hosted by Stokey till a 1962-63 ABC version that had Pat Harrington Jr. as host until being replaced by Stokey halfway in the run..Stump the Stars, a Syndicated Pantomime Quiz, ran from 1969-70, also with Stokey as host.. Excellent talent here-I imagine this would have been fun to watch..
As most regular readers know, we've had an issue with the blog that caused the side links to slide to the bottom of the page..After a couple nights ago tearing what little hair I have out trying to fix the problem..I ultimately just deleted the country music on tv post, which seemed to cause the issue in the first place. The problem seems to be solved, and now the links re on the left, though I may change the template again to something I can live with for awhile..
Also:Ed Golick, a Classic Broadcast TV fan from Detroit, has been kind enough to add a Cleveland Classic Media link to his page, which deals with Classic Detroit Kids TV, including shows/characters like Johnny Ginger, Poopdeck Paul, Wixie Wonderland, Woodrow (yes, Clay Conroy did Woodrow in Detroit for 4 years), Sagebrush Shorty, Soupy Sales (Who had been at WXEL Cleveland) and many others. 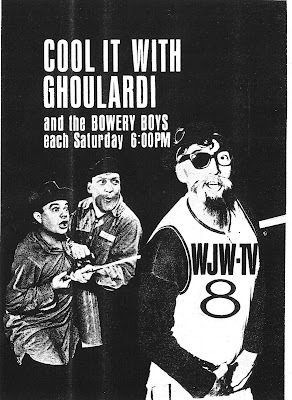 He also has links to other Detroit TV and Radio/commercial sites and just general memories of living in Detroit..Very well done..Golick also contributes to the Classic Michigan TV boards which will also be linked.. Membership card to something called "The Early Bird Club" with Carl Day-Even I handnt heard of this..
Picture originally featured in the April 18, 2009 blog post..The anonymous poster below refers to it..
About 3 weeks ago, Cleveland Classic Media reader Ed Thomas shared several vintage 1970's WJAN-TV Pictures on the occasion of The shutdown of Channel 17's analog transmitter April 17, 2009. There has been a lot of good comments about the pictures along with memories of old Channel 17..Local TV at it's "finest"..As we've said before, Janson Industries deserves credit for trying to make a go of it, but it ultimately wasnt meant to be for WJAN.. I'd like to share some particularly interesting comments from an anonymous poster from May 9, 2009..Gives a lot of Insight about how channel 17 and even WAKR-23 was run at that time..
"The guy on the far left in the first telethon photo with Milton the Milkman is none other than Max Heywood. The PC-70's came from RME productions in Columbus when they went belly up. WAKR-23 bought one, WJAN-17 bought two. They were used on the USS Hornet when the Apollo 11 astronauts returned home. Milions of people watched video from these cameras before WJAN bought them. In the 1972 MDA Telethon photos, the guy who looks like David Crosby was Tim Davidson (can you say Contemporary-Q?). Guy next to him is Max. Transmitter photo is circa late 70's. Townsend model TA-15, upgraded to a TA-30. 4KM100LA external cavity klystrons in the PA cabinets. This transmitter signed WJAN on in 1967 and was in use when analog was terminated, albeit with an updated exciter. Pretty reliable, WJAN was first commercial station in Ohio to adopt a 24/7 air schedule. Old style TV camera was a TK-41C. WJAN bought a truckload of these from NBC NY about 1974 when NBC upgraded. Three image orthicons for pickup, about a million knobs, took a long time to set up. Comments about programming are mostly spot on. In that era, there were hundreds of struggling independent UHF stations on the air. IMO, all were cut from the same cloth. If you could thrive in that environment, you were ready for anything. Call it "TV boot camp". Many people passed through these small market stations on their way to greatness. I remember Carl Monday when he was a shiny faced KSU intern doing the 10 PM news. " I've invited the poster of these comments to make himself known, so we can give proper credit..Go to my profile.There is a link to my email address.Great comments..
From what I can remember about WJAN the broadcast equipment had to be far from top drawer. 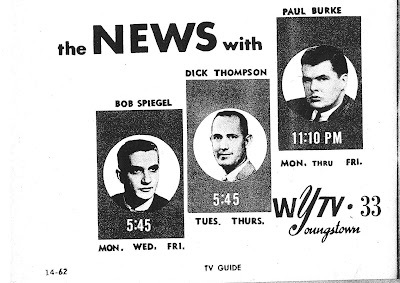 Everything seemed so bargain basement, even compared to WTRF channel 7 and WSTV channel 9. Thanks for the WJAN entries. I just read all of them. WJAN was the worst TV station I ever watched, but I loved it. I watched it al the time. It was so much fun. Like watching Cleveland TV in the late 1940s. Here's some things I remember. They ran a lot of industrial fillers. I actually sat through a film about Kikuman (sp.) soy sauce once. I have a high tolerance for boredom. Another favorite was a local evangelist with the last name of Mayle. (Isn't half of Canton named that?) He was kind of a greasy guy with a mushtasche, a bit overweight. Why a Pentecostal had a supply of light-up Virgin Mary portraits I don't know, but if you called in and pledged X amount of money you could get one. My fav, though, was the Greek show where some old Greek guy with an easel and a bunch of pictures would play music and flip over the pictures. I also remember Larry Flynt came up and did an interview with Chuck Healy (I think) abbout the old Hustler Club in Columbus. Another time, singer David Alan Coe showed up and declared that he knew for a fact that Burt Reynolds was going to be charged with murder in the death of Sylvia Mile's boyfriend. I'm still waiting. Finally, the Canton Area Peace Movement got a lot of play. I remember reading some newspaper columnists saying that some columns write themselves...well this is a good example..My memories of 17 are of the early 1970's..When I would get a charge of seeing TV commercials for any company based in Canton..Was very rare then..The Cool Ghoul..Milton The Milkman who would show very bad cartoon prints..When a movie from 1960 or beyond was a big deal for them.. 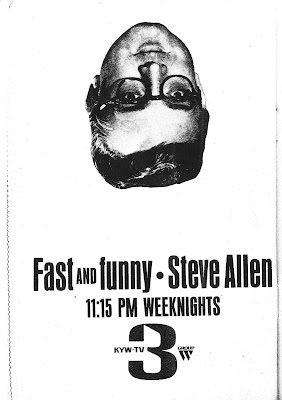 When Color shows and even early 70's network reruns were a big deal..People like Sherry Lee,Ben Werk, Carl Monday, Jerry Healey, Randall Gerber and Allen Davis, who after a long and varied career in Cleveland Radio/TV and working for the Cleveland Indians, became a Pastor in the Canton area..Steve Bozeka, who moonlighted from his Sears Carpet sales job to be the spotter for Monday Night Football on ABC..worked High School games..Ronnee Furman, Radio voice of the old WOIO-1060 and WHBC, was an interviewer (and easy to look at) .The kind of station Channel 17 was is long gone..And while its easy to make fun of them doing things on the cheap..Part of me wishes that kind of local TV was still around..it seems more human..
Summer 1964:Ernie Anderson and the weather? 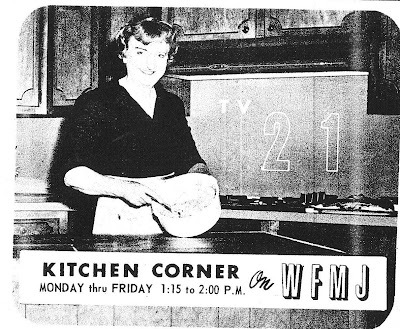 TV Guide ad for "Kitchen Corner", long running afternoon show on WFMJ-21..The show ran from 1953-till 1966-67 with hostess Marjorie Mariner..
TV Guide ad for "Masterpiece Theater"..Ghoulardi's (Ernie Anderson) secondary program Saturday nights at 6 on TV 8 June/July 1964, when Ghoulardi was hitting his peak of popularity. The PGA's Cleveland Open was contested at Highland Hills Golf Course..While every other ABC affiliate aired it live, WEWS aired it on delay Saturday June 27 and Sunday June 28 at 7:30 PM..Tony Lema was the winner. 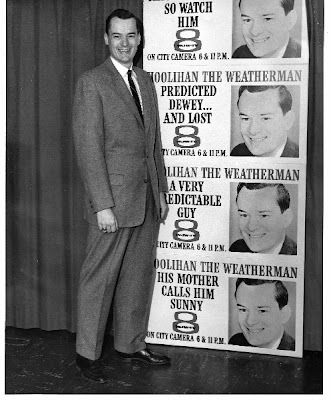 Ernie Anderson, in addition to his "Ghoulardi" duties and WJW announcing chores, also did weeknight weather at 6:20 PM on channel 8. Chubby Checker is Co-host on the Mike Douglas Show this week on KYW-3 12:30-2PM Mon-Fri.
On WJW-8, Jim Doney's Adventure Road is shown 6 times a week weekdays at 5 PM and Sunday nights at 9PM-In color..
3 Movie-The Egg and I-1947-First of the Ma and Pa Kettle Movies..
33 Cleveland Open-Live-Chris Schenkel is among those reporting the action-Interesting oddity-Schenkel is on 2 networks competing against himself..
27 Mr. Ed-Introduction of the Post's New Neighbors. The Kirkwoods, after the death of Larry Keating, who played Roger Addison..
8-27 Ed Sullivan-Frank Sinstra, Bobby Vinton, Ferante and Teicher are among the guests.